Literally nipped in the bud: Great Wall rose in the Renegade’s garden, November 30, 2007. 12-01-07 — December may be the cruelest month for the garden, bereft as it is of any inkling toward heat or hope. Remove Christmas from the equation and one would stare straight ahead at thirty-one days of bleak purgatory, cold and colder days neatly severed from any lingering fondness for the glories of autumn. Winter is no longer forthcoming, it has landed full force on the desolate, deserted beach, and any local resistance has long since hightailed it to the hills. By January, one is at least aware of being in the midst of getting through winter. December simply looms. Days grow shorter and darker, and we face each grimly, as if mindful of a January 2nd colonoscopy appointment. Time, then, to hunker down and do some armchair gardening. There is much to ponder and discuss! New Look at Tiger Eye? To be fair, this photo was shot in late November, but all of October the plant was little more than an eyesore in my garden. 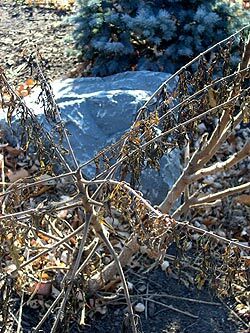 Is anyone else a bit dismayed over the dismal fall appearance of the highly touted Tiger Eye sumac (Rhus typhina ‘Bailtiger’)? I’ve planted scads of them in client’s yards, and must have ten in mine, though that’s a phenomenon to which I’ll return in a moment. 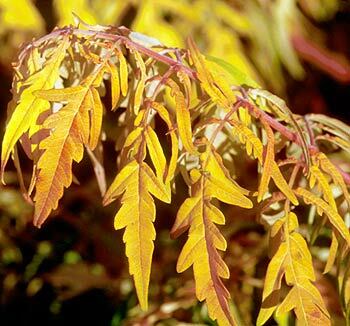 One of the hottest new shrub introductions of the decade, Tiger Eye is flat-out gorgeous in spring and summer, delicately serrated yellow-gold foliage slinking and swooping from sculptural, coppery branches. But by mid-fall, well before first frost, the leaves on mine flat-out lose it. First-time growers might wonder if it hasn’t died. One wholesale catalogue I rely on notes that, “In the fall the leaves are a brilliant combination of yellow, orange and scarlet.” Maybe I’m doing something wrong, because all I’m getting in the fall is yellow leaves shriveling to a brilliant brown. Anyone out there who grows it seeing good fall color? Another thing I’ve noticed about Tiger is that it can be a suckering little devil. Funny, there’s a nice one I planted in a yard just two blocks from my house, and in its third season it’s still a single, growing stouter and taller, beautiful, beginning to arch over a bluish traprock boulder I’d placed it beside. Meanwhile, in my yard, the three original specimens I planted three years ago are now ten to a dozen, and I’ve resorted to chopping them out with a shovel to keep them thinned. Anybody want some? Tiger Eye in its more sizzling mode. So maybe that’s my answer: more water. I didn’t water my Tiger Eyes much during this summer’s drought, come to think of it, since native sumac grow like weeds across the Midwest, drought or monsoon. Should have realized, Tiger Eyes is native only to the commercial greenhouse laboratory that spawned it. This confession coming from me, I realize, the king of yelling at readers to water their small trees and shrubs. Well, do as I write, not as I do. So thanks for the photo, comrade. Incidentally, Mr. Vogt hosts a winsome, delicate blog devoted to poetry, nonfiction, environment, and gardening, named The Deep Middle, www.deepmiddle.blogspot.com. A catastrophe just occurred in the charming little village of Greenwood, Minnesota, just up the road from my humble half-acre. It’s a good reminder to municipalities and homeowners alike: Before you plant, look up. 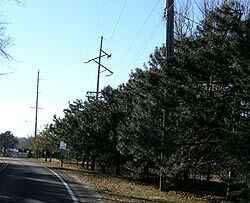 Twenty years ago or so the city planted six-foot Austrian pines (Pinus nigra) in a single, curving row alongside the road that winds out of the lake town of Excelsior. Must have planted sixty of them. Nice idea, this lovely swath of robust evergreens lining the main traffic corridor as one enters the village proper. Green wood, indeed. Planted most of them a good twenty feet from the road, too, so that their future width wouldn’t be a factor. But they apparently never looked up. The power lines were there all along, were there from decades before, and they certainly aren’t going away in the future. But a few months ago the top third of each 25’ pine went away, strict orders of the utility company that frankly had no choice. Now, as one drives this lovely little stretch, the view is dreadful. You run into articles about this happening all across America. It upsets the neighbors, and it should. Except it should never happen. Hey, public works departments of American towns and cities, look around before you plant a tree! Know the mature width and height of whatever it is you’re thinking of planting. Twenty years ago the city of Greenwood didn’t have the options they have today, but still, there were pine and spruce varieties in 1985 that would take fifty years to lumber upwards to 25’. Even Techny arborvitaes would have been a better choice, and lord knows that in 1985, plenty of those were available. Before I forget, earlier this month I completely rewrote the 10 Tenets. Hadn’t touched them since staying up all night ten years ago, chugging coffee, blasting, I don’t know, Kinks or Dre or probably Outkast on the stereo, pounding out an explanation of what this site is allegedly all about. To my surprise, as I cracked them open for a second look, I didn’t change any of them, that is, didn’t remove one or two and replace them with some better rulings. So yes, “Gardening and rock music do not mix”—the one I get the most e-mails about, except for maybe how it’s OK to cut down a tree—still stands. I’ve just strengthened my argument. Here’s a shot of a burlap wall I erected a few weeks ago, a reminder to northern readers that the best way to protect newly planted evergreens from winter burn is as you see here. 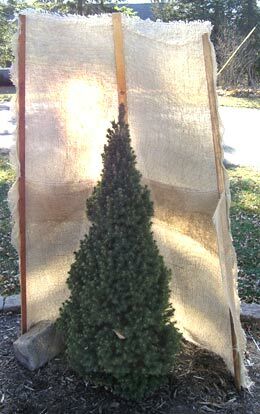 Never wrap evergreens in burlap; as sun and wind pound the burlap all winter, it wicks moisture from the needles and does more harm than good. Instead, pound three stakes of proper height into the ground and create a burlap wall on the south side of the plant. Don’t forget that the wall should extend high enough that the sun doesn’t angle down and fry off the top. The tree pictured is a cool new spruce, Rainbow’s End (Picea glauca ‘Rainbow’s End’) that I planted in an expanded bed in my yard (read: goodbye more grass) this fall. 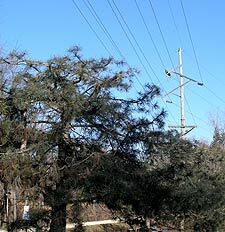 It’s a cousin of the Dwarf Alberta Spruce, notorious for winter burn in Zones 3-6. This is supposed to handle winter better, but for its first fling with tundra season, and until it has had a full season of root establishment, I gave her the wall treatment. New growth in spring is light green, by the way, followed by a second flush of bright yellow, so I had to try it. 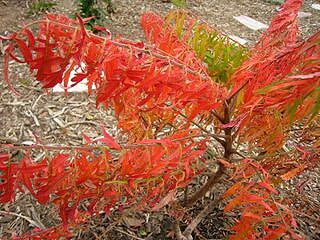 For more about Rainbow’s End and a better picture, check out this month’s Plant Spotlight. Just a reminder, the ballots have been tallied, the bribes have been laundered, and the VFW has been booked. The very next update, January 1, 2008, is the moment the gardening world has been dreading: the announcement of the 2007 Renegade Gardener High Spot/Black Spot Awards. Sleep in, roll out, log on to RG.com, and join the party. The bloody Mary’s will be on me. Came across this photo while cleaning up the computer and realized I’d never used it in any of my various wilderness/nature ramblings. I shot it, oh, sometime in the last 15 years, in Ontario, certainly. It’s not bunchberry, bunchberry has six leaves, and I can’t find the plant in any of my field guides, but no matter. I should set the scene, it’s a cold one today, sunny, but we won’t see much better than 20 degrees, and the weather gurus are predicting a healthy dump of snow across much of Minnesota this weekend. 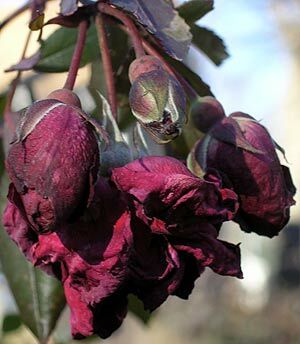 I’m finished gardening for the season, have been for weeks, and am feeling a bit melancholy about it, as if a lover has casually announced she’d like to spend some time apart. So I’ve found myself staring at this photo off and on. It reminds me that nature hasn’t really left, that nature never leaves, that we’re the ones who choose to come and go. This tree was felled by chainsaw to clear a path twenty years before I came upon the scene, and in this case, at least, nature doesn’t seem to care. 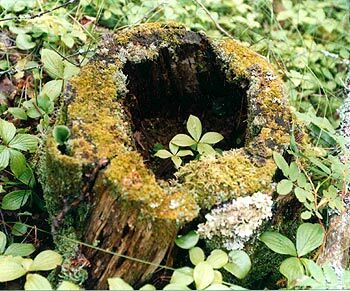 Nature just minds its own business, moves slowly along, every situation an opportunity for growth. This winter I’m going to pretend I’m the big guy in the center; safe, protected, hanging out with a couple of pals in this cool fort I found. And man, what soil! I think I’ll make it my desktop.